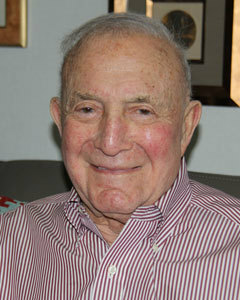 After serving in both World War II and the Korean Conflict, Harold Brown converted his MIT degree in Engineering into a senior officer position at Walworth Value Co. of NY, managing annual sales of $170 million. Thereafter, Mr. Brown returned to his hometown of Boston, where he acquired his first six-unit apartment building in 1954. Recognizing the long-term stability of the residential real estate industry, Harold Brown leveraged his contractor and brokerage licenses and began to acquire and develop over 10,000 residential units during his 64 plus-year real estate career. Today, as Chairman Emeritus and sole stockholder of The Hamilton Company, Inc., Mr. Brown works with four senior officers and 170 full-time property managers, property coordinators, brokers, accountants, architects, maintenance, technology and legal staff supporting the day-to-day activities of over 5,700 apartment units and 2,500,000 SF of commercial real estate. Harold Brown established the Hamilton Charitable Corporation in 1985. Hamilton Charitable was formed to encourage the growth, education and rejuvenation of community-based private and public institutions. The Corporation contributes $500,000 annually to medical research, educational scholarships, area community groups, local and private projects and arts organizations. Recipients of funds include Massachusetts General Hospital, Massachusetts Institute of Technology, West End House, Allston Main Streets and the Coolidge Corner Theatre Foundation. In addition to Harold Brown's personal accomplishments, he has also successfully restructured New England Realty Associates (NERA), the only Massachusetts Limited Partnership actively traded on the NYSE MKT under the symbol NEN. Prior to taking on the responsibility of managing general partner in the mid 1970's this company was insolvent. Today it enjoys close to a 40 year history of distributions and profitability.